Answer: You’ve obviously noticed how your sundial doesn’t work too well at night. No, there is no such thing as a “moondial,” since the motion of the Moon is not as regular as the Sun. But there is a way to tell time at night by observing stars in the northern part of the sky. It’s not easy. 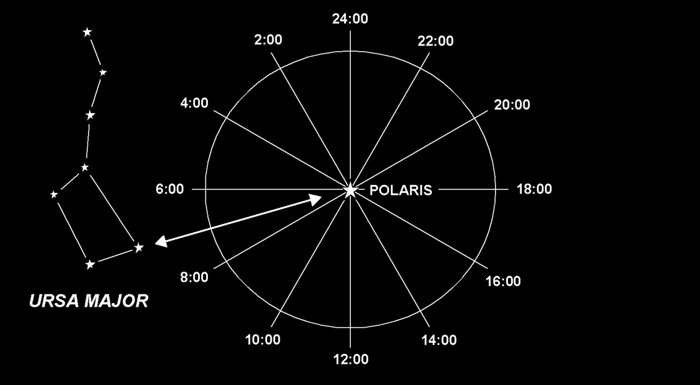 First, visualize a reversed 24-hour clock centered on the north star (Polaris). Second, find Ursa Major, the “Big Dipper,” which will be visible most of the time during the summer. Next draw a line from the bowl of the Dipper to Polaris — this is the hour hand of the clock. Now read the time, estimating between the hours if needed. In the example above, the time would be 07:00 hours (7 am). Then add 6 hours, which brings you to 13:00 hours (1 pm). We’re using a 24 hour clock to keep the arithmetic easier. Don’t set your watch yet. The next step is a correction based on the month. That correction is -2 hours/month, so for August (the 8th month) you need to subtract 16 hours, i.e., 13:00 hours – 16 hours = -03:00 hours = 21:00 hours. Finally, express that time in its simpler form of 9 pm. Go outside tonight at 9 pm and verify that the Big Dipper is in the position shown. It won’t be exact, but it will be close. You can get better accuracy by estimating fractions of the hour and month. Or, you could just wear a watch.